Draw your own impossible figures! Get yourself a pencil and a ruler, and download a Tizit. The text will explain how the "Westminster Whimsy Works" distributes pictures of "irrational objects," and invites you to draw one. Then, there's a scattering of labeled points, and instructions showing you which ones you should join together. Join the dots as instructed, carefully with ruled lines, and a Tizit will appear! The Westminster Whimsy Works, as well as the Tizits, are the whimsical brainchild of Mac Oglesby, a retired math teacher. 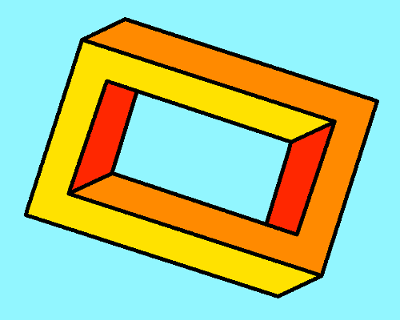 There are 30 Tizits you can download from this page. 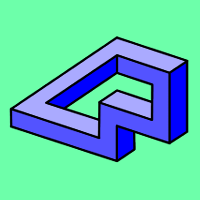 Each one creates an impossible picture, like the famous "Penrose Triangle" or the "Blivet". When you look at one, you naturally ask yourself "What is it? ", hence the name "Tizit." I showed Mac Oglesby this picture, and he said "I somehow prefer the children's work." Me too. I'd love to replace the picture above with some colored-in Tizits made by your kids. So, if you use these Tizits in your classroom or home, do take the time to scan in the kids' work, and send them to me. I'll set up a gallery page with all the submissions I get! You'll need to download the Tizits first, so here they are. Be sure to carefully read the instructions showing which dots to join. Capital letters matter! Don't get 'c' and 'C' mixed up! Have fun! And don't forget to send me your kids' colored Tizits so I can post them here for the world to see!